Participate in our upcoming photo contest. The Olympic Peninsula is a scenic place. 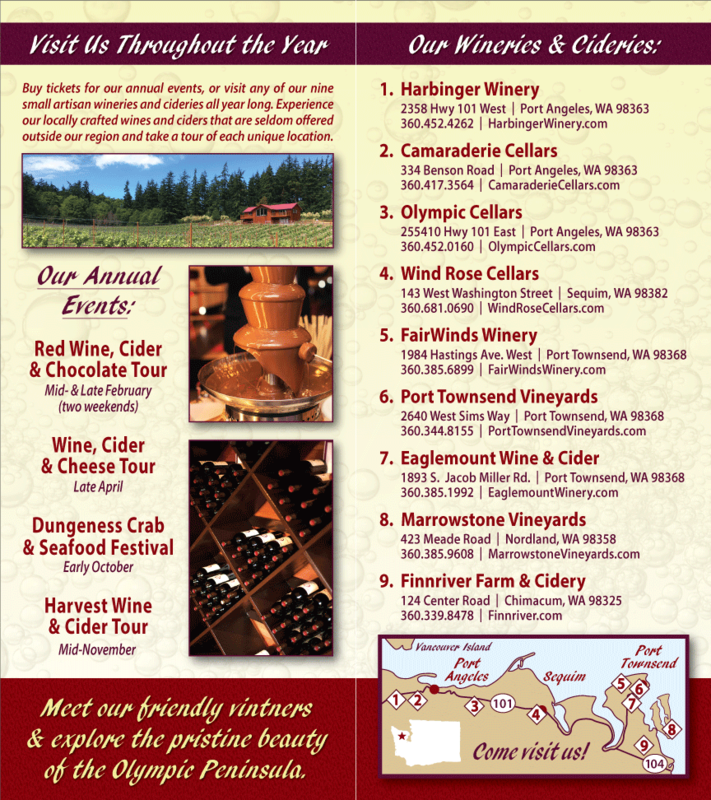 Bring your camera to the Olympic Peninsula Wineries NW Wine and Cheese Tour on April 14 and 15, 2012. All are invited to participate in our first annual “Sip Wine and Cider, Say Cheese” Photo Contest. Our wineries and cideries are located in some truly lovely spots. Olympic Cellars’ historic barn, with the Olympic Mountains in the background. Finnriver Farm & Cidery’s rolling fields and orchards. Camaraderie Cellars’ expansive patio and lush gardens. Harbinger Winery’s cool, industrial setting. Black Diamond Winery’s acres of grapes overlooking Tumwater Creek. Eaglemount Wine & Cider’s lovely historic homestead and orchards. FairWinds Winery overlooking the Olympic Mountains outside Port Townsend. Wind Rose Cellars’ cozy tasting room in the heart of downtown Sequim. Take photos of the scenery, the Washington wine, hard cider, the cheese. We’re looking for memorable photos to mark the occasion. The top 3 entries will be posted on the Olympic Peninsula Wineries website and Facebook page. Winners will receive a pair of tickets to the 2012 Harvest Wine Tour, November 11-13. The historic barn at Olympic Cellars.